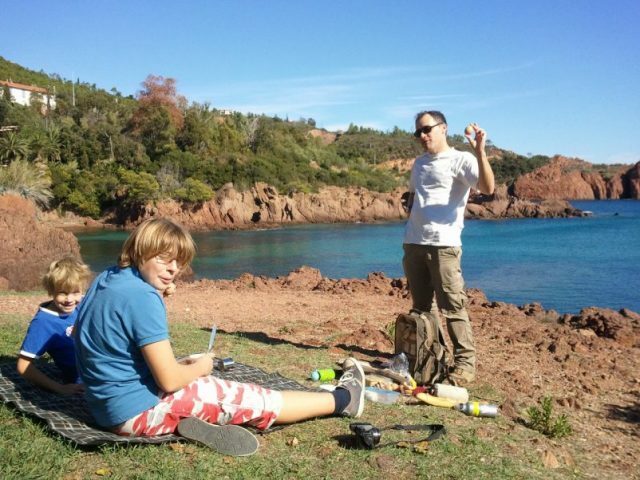 As a family we love going on picnics in this wonderful part of France that we call home. The varied landscape and the lovely climate on the Côte d’Azur make this area a picnic paradise. There’s really no time of year when picnicking isn’t possible and we picnic in all seasons. 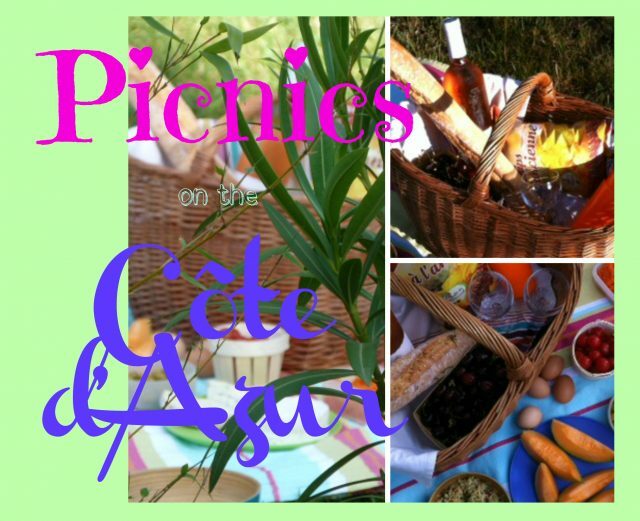 I’m happy to share with you here some of our favourite locations in the mountains or by the coast, by rivers and on islands, these are our 10 top picnic spots on the Côte d’Azur. An absolute favourite spot to picnic, which is always a success with visitors when we take them there, is a plateau high above the village of Tourrettes sur Loup called le Caire. Situated at 825 metres altitude, on a clear day it has spectacular views over the coastline stretching from Italy in the east to St Tropez in the west. The vast open area is wild, often only shared with a few goats and sheep, but only 15 kms as the crow flies from the crowded Côte d’Azur. It’s great for flying kites and just enjoying the immense open space. To find this magical spot, take the D2210 into Tourrettes and turn into Route de St Jean opposite the main square, next to the Bar du Midi (on the left coming from Grasse, on the right coming from Vence). Take the first right into Route du Caire and keep going straight up and up (it’s very steep and narrow), past some riding stables “Le Ranch du Baous”, until the end when you can go no further by car (about 3 kms). Park and take the footpath on the right (signed “Piste du Jas Neuf”). It’s about a 15-20 minute walk along a rocky ridge where I don’t think we’ve ever come across another person; it’s beautiful and unbelievably peaceful. It’s possible to take pushchairs and kids bikes, the path is just about smooth enough. The drive along the coast from Théoule sur Mer to St Raphaël around the Estérel Massif is stunning and full of gorgeous spots to stop off and picnic. The sparkly turquoise water contrasts beautifully with the red rock and invites you in for a dip, you won’t be able to resist on a hot day, so don’t forget your swimmers. Take the D6098 out of Théoule sur Mer (which becomes the D559) and follow the coast. Simple. The Lérins islands consist of Île Sainte Marguerite and Île Saint Honorat. They are both lovely and we usually go to which ever one has the first ferry leaving. This usually means Ste Marguerite as there are many more ferries a day than to St Honorat. For total peace and quiet I recommend St Honorat as the island is owned and run by a silent order of monks as and such you are expected to be quiet when visiting. 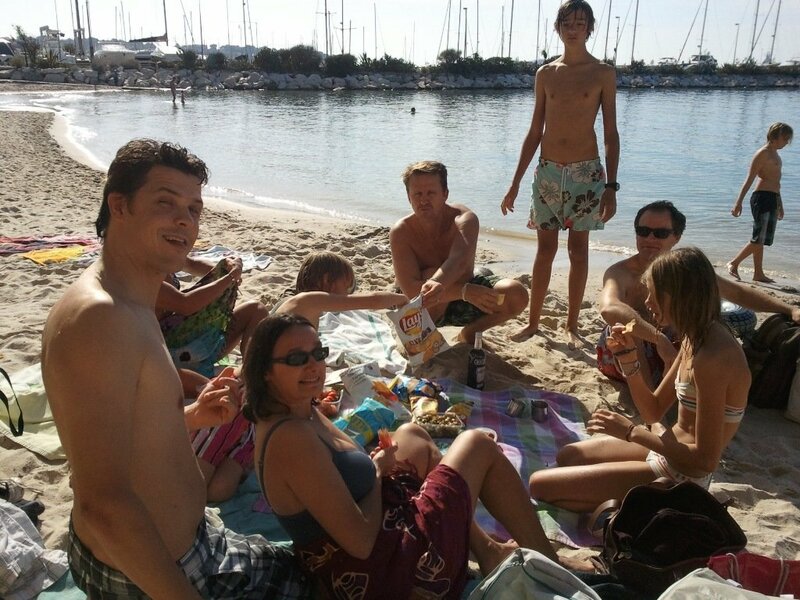 If you have a group of small children then Ste Marguerite is definitely the better option. Both are full of quiet rocky bays where even in high season you can often be alone on your own private beach. They both also have forts which can be visited. The islands are beautiful all year round and living nearby we often go in winter. The kids once swam in a sheltered cove in January! There are no cars on either island so take a backpack picnic if possible as you may want to walk to the far side, away from the ferry jetty. Even with small children you won’t need to walk more than 20 minutes to get away from the main body of people. Ferries leave from the Port in Cannes, 20 Quai St Pierre. They go every day throughout the year, take 15 minutes and can be booked online. More info on their website here. The Riou river is relatively undiscovered compared with other local rivers and we rarely come across many other people here. 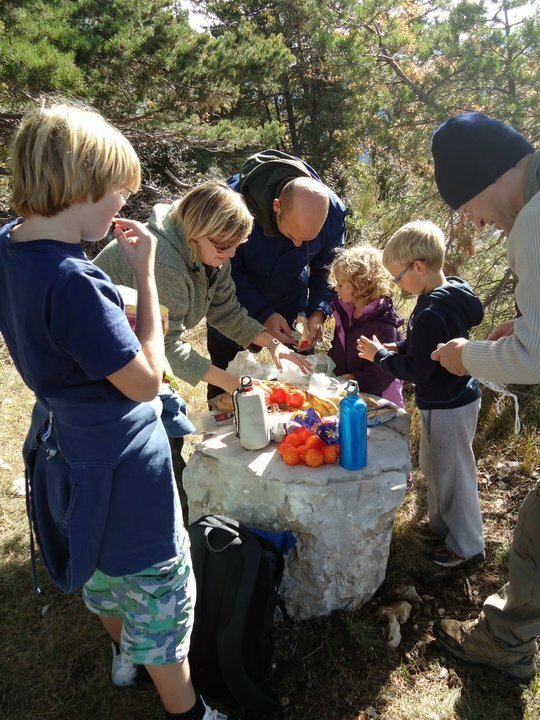 Our favourite picnic spot can be found after about a 30 minute walk along a mountain track through the forest. You leave the hustle and bustle of town life behind and find yourselves in a magical area of gentle waterfalls and crystal clear mountain water. For a full description and directions on how to find this place take a look at a previous post I wrote all about it here. The Cap d’Antibes is a surprisingly wild cape considering it is home to some of the world’s richest people and synonymous with massive wealth and high-end luxury. There’s a gorgeous walk right around it, about 5 kms long, but just for a picnic you don’t need to go far. Park in the car park behind the plage de la Garoupe and take the path that runs along the right side of the beach along a stone wall. You’ll soon come to a wide open point with magnificent views over the eastern side of the Côte d’Azur and across to the Alps behind. Further on along the coast path there are few places to make a camp and at times there is no room at all to leave the narrow track so if you are intending to do the whole walk I suggest eating here first. For details about this walk and many more photos take a look at this post. 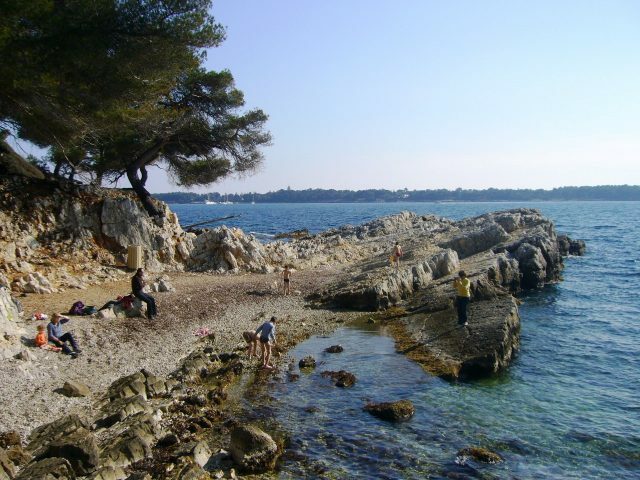 From central Antibes or Juan les Pins follow signs to the Cap d’Antibes and plage de la Garoupe. There is a big car park here but in high season and sunny weekends particularly Easter you may have difficulty finding a place unless you arrive early. If it’s full you’ll just have to try and find street parking in the area. This was one of the first “picnic spots with a view” we discovered on arrival in the area in 2007 and it’s become a firm favourite. After a 20-30 minute walk from the Domaine des Courmettes – a grand old house used for seminars, events, nature groups etc – through meadows and ancient green oak forest you come to a lookout point with a million dollar view. There’s a small (locked) hut from where the fire service survey the area in summer watching for forest fires. It really does have the most amazing view of the coast. 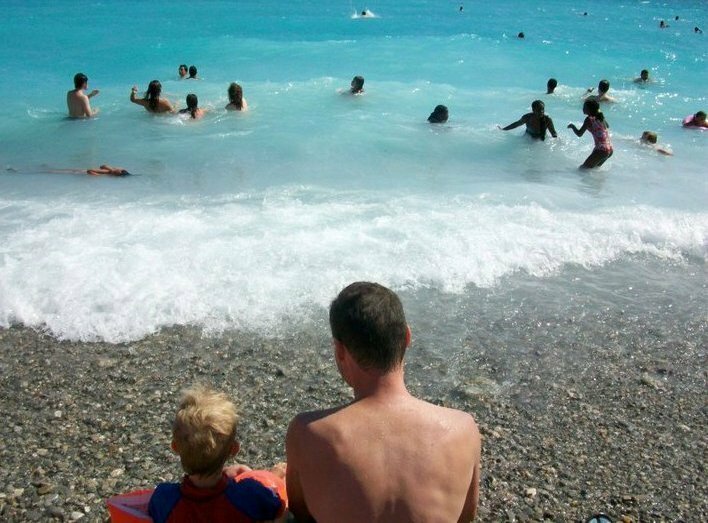 In the photo above you can see the Cap d’Antibes half way between the child and the right edge of the picture. To get there coming from the direction of Grasse, pass through the hamlet of Pont du Loup heading towards Tourrettes sur Loup and after 3 kms turn left at the sign “Courmettes”. Coming from Tourrettes follow direction Pont du Loup, after 5 kms turn right at the sign “Courmettes” shortly after the bus stop “St Antoine”. The road is not tarred all the way and is narrow, windy and steep for 4 kms. Not for the nervous driver! Continue about 300 metres after you pass a farm (which depending on the season sells delicious goat’s cheese) until you see a grand building with beautiful plane trees. Park anywhere here. The walk starts from behind the house (to the right when facing it) or from the gate at the bottom of the car park area (left if facing the sea). Follow the path until you come to a gate on your right in the shade of green oaks. There’s a sign explaining the sheep dogs who live permanently with flocks of sheep as protection from wolves and a hiking trail sign too. Go through the gate and continue straight towards the little hut. Don’t turn left in the forest. I’d be amazed if there’s anyone else there with you (except perhaps a person on look out duty in the summer). Our nearest beach is Rosy Beach in Villeneuve-Loubet. It’s a pebble beach with a nice restaurant and board walk along the seafront. It may not be the world’s greatest beach during the day time (though it’s lovely to walk along the board walk at any time of year) but it makes a great place for a casual evening picnic. Being only 15 minutes away we often go for an evening dip and apéritif. The evening colours are subtle and calming and there are rarely many other people around. Remember to bring beach shoes or crocs if you intend to swim! You’ll find Rosy Beach at the end of l’allée de la Plage off Route du bord de Mer (the seafront boulevard) almost opposite Géant Casino hypermarket. There are several car parks around but for guaranteed free parking use the supermarket car park. Picnicking by the Loup river is one of our great classics. 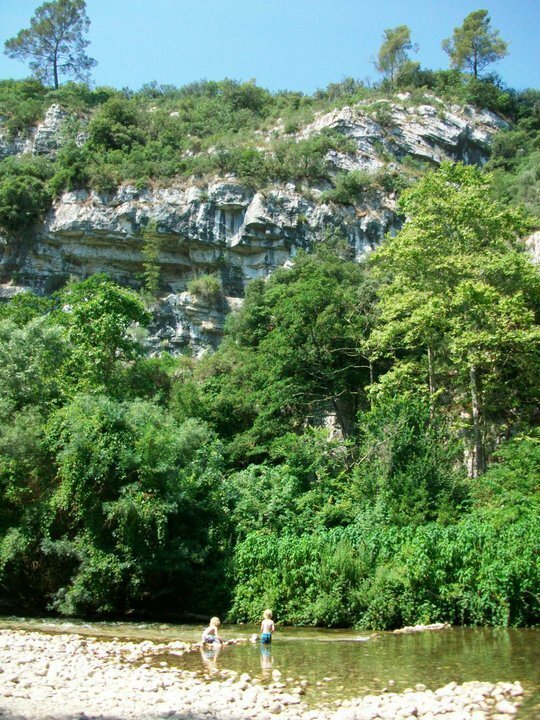 It’s another spot that’s only minutes away from Lou Messugo, after a very pleasant 15-20 minute walk along the river banks you find yourself on a stony beach under majestic limestone cliffs with the fast-flowing Loup to swim or paddle in or just skip stones. We come here in all seasons which is the subject of another post here. Park at the kayak club in la Colle sur Loup and follow the path to the end. The kayak club is off the road on the right coming from Roquefort towards la Colle just before the village starts. Look for a kayak standing on its point as a sign. It’s on the left heading out of la Colle towards Pont du Loup/Roquefort les Pins. The plateau de Caussols is a vast area of semi-wilderness around 1000 metres in altitude high above Roquefort les Pins. It’s an unusual and sometimes spooky location where the weather can change fast, but it’s excellent for hiking, kite flying, picnicking and generally getting away from it all. It’s often snow-covered in winter with gorgeous wild lavender and thyme in summer. The plateau is composed of a rocky plain with caves and bronze age dwellings around the south and a fertile cultivated plain in the centre. Depending whether you want cliffs and views – where you can usually watch paragliders taking off – or secluded picnic spots, the drive from Lou Messugo is from 25 minutes to an hour. Just get lost on the little roads and pull up wherever you fancy. (Just try not to get too lost!) You’ll be alone (unless you’re at a paragliding site) and will have all the space in the world to play/snooze/smooch/whatever! Head to the stunning hill village of Gourdon and turn on to the D12 (right coming from Vence, left coming from Grasse). Continue on this mountain road for about 6 km then take a left turn. As I said before, just drive around until you find somewhere you like. We usually go on for another couple of kilometres past a couple of isolated houses and then pull up off the road where the landscape opens out. There’s no shortage of choice. One of the loveliest things being a resident here is that we can go to beaches out of season. The picture above was taken in late October. As you can see the beach is empty but the weather was perfect for being on the beach and even swimming. We often go for big picnics with friends on one beach or another along the coast though Port Gallice is definitely one of our favourites. For more about this beach click here. Port Gallice is on Boulevard Edouard Baudoin in Juan les Pins. There is a sizeable (paying) car park for the marina or if you’re very lucky free parking on the street. The beach is on the right if facing the sea between the car park and the Hotel Belles Rives. 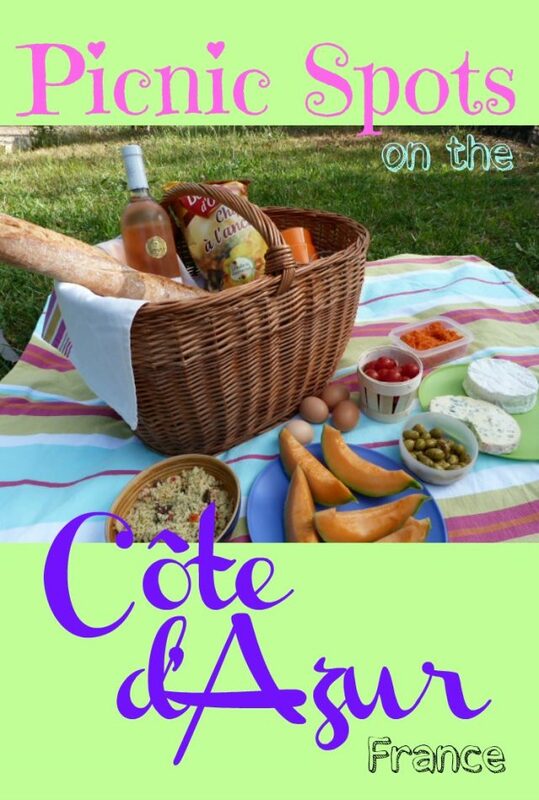 At Lou Messugo we can lend our guests picnic backpacks, cool-bags/eskies, ice blocks, picnic rugs and most other things you might need to make the most of these 10 top picnic spots on the Côte d’Azur. Do you like picnicking? Where’s your favourite spot? Do tell! Why not save this Pin for later! South of France is the area I have to explore yet. Those picnic spots look awesome. I wish I could be there right now. Thanks for sharing! Bread, pate, cheese and some warm ripe tomatoes …. I need to be in the South of France now! It’s pretty amazing really as they are just off one of the most popular spots, the Croisette in Cannes, but all the better as far as I’m concerned. A French baguette, cheese, wine and melon? In a picnic basket to go? Just dreamy. Literally dreamy. I pick the one by the water. Love it. 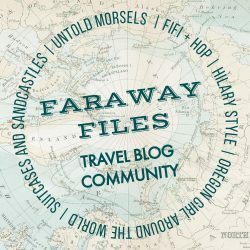 Thanks for sharing with #FarawayFiles! Thanks for your lovely comment Erin. Come and have a dreamy picnic with us soon! Yes we’re very lucky and love living in this gorgeous part of the world. Then what are you waiting for Clare? I’d love you to jump on a plane. I’m so pleased you enjoyed this post. How lucky for you to have all these great choices to spend some time outdoors all year. The beach in the off season is always a blessing. I’m leaning more towards the Loup river here for my choice. I guess because it’s something a bit off the beaten path. I want to visit your part of the world soon. I’d love you to visit Mary, and I’d love to show you some of these places. I seriously want to hop on a plane, book a room at Lou Messugo and go on a Cote D’Azur picnic right now. So gorgeous! Do it Michelle, we’d love to have you here ! Isn’t it great? I’ve had it for ever. Picnics are the best! Such a great way to spend a summer’s day. All these spots look great! Picnics are such a lovely way to spend a sunny day – especially when you can go out of season as well! You can pack me a picnic any day – YUM. Thanks for linking up with us again. When are you coming then SJ? I am so jealous. Those are like the mother of all picnic spots. Really beautiful! And I love your basket. The basket is ancient, I’ve had it for ages and it packs a good picnic!! le Caire looks lovely. Well they all do but I like the idea of all that space and the view. I should picnic more often. le Caire is very special. The silence, the views and the animals all make it a fabulous place to spend the day. We do eat outside every day from about April till October here, and picnic almost every weekend. We are lucky to have such good weather too. We are a very family friendly holiday apartment Hannah, please do bring Toby, not just to “our neck of the woods” but to Lou Messugo! Good to hear from another happy picnicker!